Summer has arrived. Flowers are in bloom. Tourists and second-home owners are flooding back to Vail. And a few issues loom large — some brought on by the recent Kaaboo proposal and other perennial problems of years past. The association applauds the town officials on the measured and deliberate way in which the Kaaboo proposal was handled. The town staff raised the appropriate questions and sought proper input before the promoters decided to pull the plug on the application. But this will not be the last mega-event proposal, the maneuvering has already begun. The Vail brand and environs are too attractive, and these or other promoters will soon again be knocking on Vail’s doors. In the case of the Kaaboo proposal, the town of Vail and Vail Recreation District staffs spent countless hours reviewing the proposal. 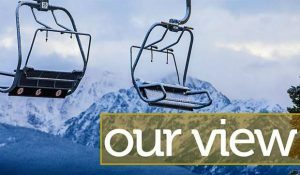 With the exception of a turf restoration consultant’s fee the expenses of the project review were funded out of the town’s and Vail Recreation District’s budget; in other words, Vail tax revenues bore the cost of the pre-application review. Event review would seem to be an ordinary expense of government except in the case of a mega-event, the impact quickly escalates. And, when the event is a profit-making venture, the justification for public expense disappears. That raises the question of whether, in such situations, the promoters should be required to pay a non-refundable, up-front fee to cover the cost of the entire review process. That way, the town’s budget will remain intact and not be adversely impacted the next time a promoter comes along with the next great idea to use the town’s image for his or her profit-making venture. Mega-events also can severely impact the town’s infrastructure. That, too, is an expense that should be borne by the venture, not the town. After all, the success of the venture is directly tied to the Vail image; that is not something that should be gratuitously granted to promoters. As part of any future mega-event, the town should develop appropriate fees for parking, police service, crowd control, infrastructure impact, etc. Those impacts should be an expense of the venture and not the town. Finally, left unanswered by the abrupt withdrawal of the Kaaboo proposal is the role of the Vail Valley Foundation in that proposal. Historically, the Vail Valley Foundation has been a community building institution. Its stated mission is to enhance and sustain the Vail Valley through arts, athletics and educational programs. It seemed to many that the private for-profit Kaaboo venture veered off course. Maybe a broad reading of the Vail Valley Foundation mission could encompass bringing a weekend super-sized music festival to Vail, but it does seem to raise the question, on whose behalf is the foundation acting? And the for-profit nature of the venture seems to raise the additional questions of whether the Vail Valley Foundation has quietly evolved to become a promoter of economic development for itself, the business community and Vail Resorts. These would seem to be appropriate questions that should be addressed in the wake of the Kaaboo proposal as they affect the entire Vail community.